2017 saw our first show in the Stevenage Arts & Leisure Centre. 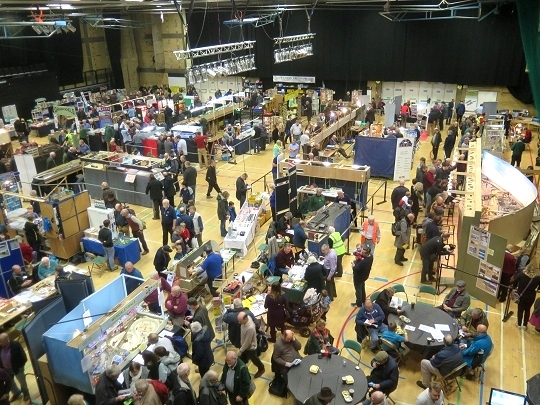 With two large halls we were able to invite more and larger layouts to attend along with a greatly increased trade presence. There were wider aisles in which our visitors could move more freely and all on one level. As mentioned in the guide the layout The Bridge at Remagen (58) was withdrawn by its owner Al Turner due to acute family circumstances. The space was filled by Questa, an On30 layout by Andrew Jones who kindly stepped in at short notice. As the replacement layout was smaller than the one withdrawn we were able to accommodate two additional members of the trade; Totem Signs and Powerbond Glue.